This year’s two top Academy Award-nominated films, Hugo and The Artist, are only the latest in a long line of tributes to the silent film era. While most homages to silent film typically celebrate early Hollywood, this charming and informative display at the S.B. 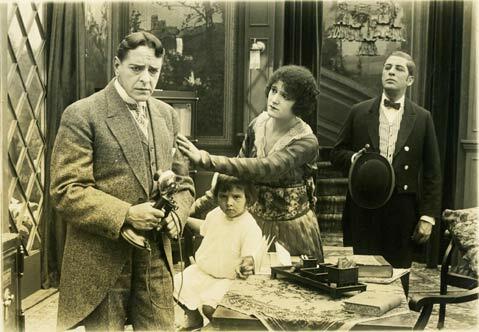 Historical Museum examines the legacy of silent film in Santa Barbara. From 1912 to 1921, the American Film Company — better known as The Flying A Studios — produced hundreds of silent films at their studios on State and Mission, as well as on location all over Santa Barbara, Montecito, and Goleta. Curators Dana Driskel and Daniel Calderon have collaborated with historian and film buff Neil Graffy to deliver an elegant installation and a fully illustrated catalogue to accompany the exhibit, which coincides with both the Santa Barbara International Film Festival and the centenary year of the Flying A’s arrival in our city. The Flying A came of age in the movie industry at a time when the Western was king, and that rugged and manly concept of filmmaking as heroic adventure comes bursting through in many of the images on view here. A life-size, full-length portrait of actor Irving Cummings in a tattered shirt and smoking a cigarette caused one visitor to exclaim, “In those days, men were men!” Other highlights include the wonderfully evocative posters, many of which feature improbably costumed protagonists like the mustachioed Sydney Ayres, who looks out at you in artist’s smock and beret from under the title “At the Potter’s Wheel.” Overall, the many graphics produced at the Flying A retain their edge well, looking just as sharp and modern as they enter their second century as they did when they were created. Actual films from the period screen continually on one side of the gallery, allowing visitors to get a feeling for the typical setups of these mostly serial dramas, along with tantalizing glimpses of familiar Santa Barbara settings. Antique cameras, film magazines, and editing equipment are also on display, along with some spectacular props. The timing could not be better for this truly enlightening tour of silent film–era Santa Barbara. The Flying A: Silent Film in Santa Barbara is on display through August 19. Call (805) 966-1601 or visit santabarbaramuseum.com for museum hours.